The company has decided to register in the European Union. In October, I2BF Global Ventures invested $20 million in Dauria Aerospace — the first Russian private space company. This event went practically unnoticed by the world’s media, especially compared to the euphoria that surrounded the launch of SpaceX and Virgin Galactic at the beginning of the 2000s. In the meantime, this company is, in many ways, a pioneer and is breaking into a field that the state has neglected. “Traditionally Roscosmos focuses on low-margin services, launching, servicing and putting satellites in space, completely neglecting the high-margin services market, which is what private companies are aiming for,” said Alexei Volostnov, business development director for Frost & Sullivan in Russia. Mikhail Kokorich, the former owner of large Russian retail networks such as Tekhnosila and Uyuterra, stepped right into this breach. On leaving the business to which he had become accustomed, he effectively turned his hobby into his job. However, his activities are not altruistic — this market is estimated to be worth $103 billion per year. 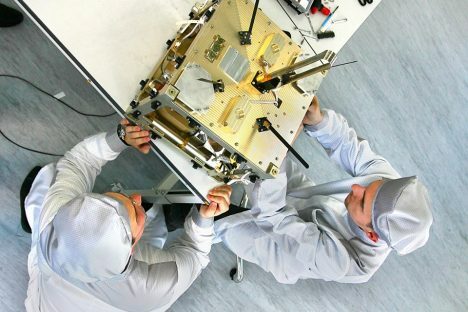 Dauria’s calculations are based on the fact that it will manufacture cheap satellites that will cost up to $10 million and can be manufactured in the space of a year. Private space exploration: Do we need it? It is planned to launch four satellites over the next few years, two of which — Saggita and Perseus — are to be launched next year, while Pyxis and Aurigaare to be launched between 2015 and 2017. According to forecasts, the company’s annual turnover will be in excess of $1 billion per year by that time. The businessman need not fear competition from state-owned companies in Russia, as the country only has a small number of space vehicles. “We only have two civil satellites — not counting weather satellites — and they require a high resolution. Our systems cover the entire Earth, but they do not require such a high resolution, which means that they provide the whole picture,” said Kokorich. Andrei Milovanov, head of the Satellite Transport Monitoring department at the Arkan group admits this is linked, in some degree, to the fact that, for a long time, the Russian space industry was just trying to survive. Meanwhile, the rest of the world modernized their satellite production, developing low-budget, small-scale systems. In his opinion, as Dauria was a pioneer in the private satellite market in Russia, this will afford it certain guarantees of success at least on the internal market. “Even up to the present day, government bodies in Russia use 95 percent foreign systems for satellite observations. Correspondingly, an indigenous product would certainly be in demand on the growing Russian market. It is more difficult to predict the outcome of doing business on the global market. However, the company’s innovative approach and its collaboration with such an experienced partner as the English company SSTL makes this project highly competitive,”said the specialist. American universities are also involved in Dauria projects, as well as Roscosmos, the Lavochkin Research and Production Association and many other organizations across the world. The company has a branch at Skolkovo making systems for the internal market; the company’s headquarters, which houses the key service division, are based in Munich. There is a division in the U.S. developing payload as well as satellite systems for the international market. Dauria’s founders are certain that only a transnational company can achieve success in this business. However, there is another reason why the company’s headquarters are not based in Russia. Experts add that the state once again strictly controls the key infrastructure, as well as the delivery vehicles. “This could mean that this field would be closed to private companies very rapidly if a decision like this is taken at governmental level,” said Volostnov.